If they can’t score, you can’t lose. We win matches by outscoring the opponent. Why not make the job easier by not allowing them to score. Here we look at one effective way to defend in PES without even using the tackle button. In your central defence, no matter how many defenders we play, it is advisable to have both kinds of defenders, a tall and strong one, and a fast one. If you are playing with 2 Central Defenders, this partnership will be recommended. If you are playing with 3 Central Defenders, the central one should tall and strong, flanked by two fast partners. Stronger defenders are able to out-muscle strikers easily. They win all kinds of aerial balls pumped into the box. Use Special Control when the ball is in the air to get into a good defensive position to clear the ball. His strength will allow him to win the aerial challenge. This partnership allow us to overcome all sorts of attacks easily. 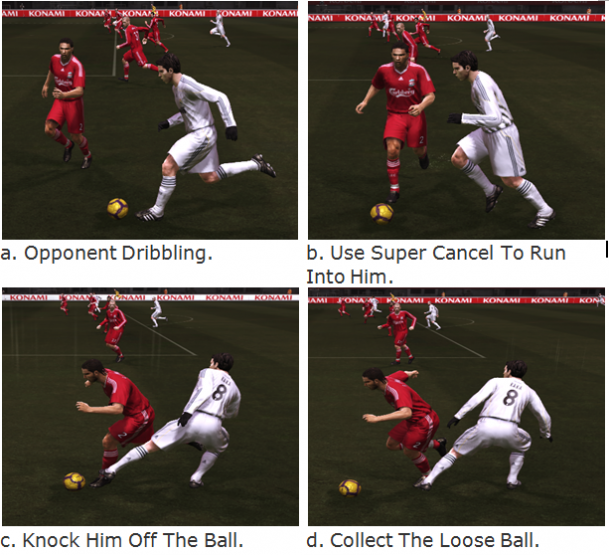 And you can use PES Super Cancel to knock a dribbler off the ball. Here’s how. Simply hold R1+R2 to activate Super Cancel. You will have full control of your player. Use your player and run into your opponent. Preferably, use a strong defender and barge into a smaller opponent to knock him off the ball. We can use this in two ways. The first way is to run into the ball carrier to dispossess him of the ball. The second way is when we are chasing down a loose ball with an opponent, the super cancel can be used to obstruct the path of our opponent. If we are slightly ahead of him, we can use the super cancel and run into his path, push him away from the ball, so as to allow us to get the ball easier. Take a look at how Glen Johnson disposseses KaKa. And just in case you miss the tackle, you will have your fast defenders to cover you in the box. This is quite an interesting, unorthodox way of winning back possession of the ball. Using the tackle button too often may lead us to concede fouls, free kicks and penalties. The use of Super Cancel serves as a good back up option. Hope you find this trick useful. Leave a comment below and let me know. Wow! Really an honour for you to visit my site, and commenting as well. Thanks for ‘endorsing’ my tricks, haha. In the PES 2010 main menu, by going to the online menu, i think you should be able to register for a KONAMI ID to participate in online competitions. If you wish to play in the major offline competitions, I think KONAMI does not organise any. Unlike EA Sports where they have yearly FIFA Interactice World Cup to put the world’s best players together to compete, KONAMI provides Online Competitions in the comfort of your homes. Perhaps they lack the resources or can’t be bothered to organise any? No problem at all, my pleasure. Thanks for finding my site useful. Yes indeed if KONAMI wishes to make PES really big, they have to start organising such worldwide tournaments, don’t you agree? Well, contacting them might be possible, but I am sure they have their marketing plans set up for the future, and listening to feedbacks from fans is something they seldom do.. judging from the several complains about the PES gameplay over all these years that are still unresolved! dude u are awesome man, way to go, keep it up! i will add u with my hotmail account, and will drop u an email. i hope u get a favorable reply from KONAMI ! Hello. I need help.i love pes and i would like to play good defence but i can’t- for example super cancel i don’t know when use and for how long?? for example if somebody run and dribble messi,ronaldo,kaka,rooney i can’t stop it-sometimes they can dribble half stadium one player and i don’t know how stop it-especially in box is terrible-i dont know how play defence-please help me- i would like to learn-Thank You very much. nice. luv d super cancel.